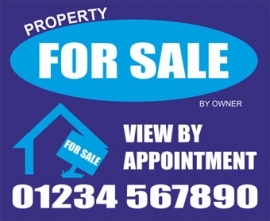 If you are Selling or renting your property without the use of an estate or letting agent, we can supply a 2 x 560mm x 460mm Sign Boards. If you would prefer your sign in another colours other than the photo colour then please feel free to choose from Red, Blue, Green or Black (Other colours can be supplied at extra cost). Feel free to change the wording if you require, maybe your website or email address is preferable. Remember to let us know the telephone number you require, when you order. Before your board is made we can send you a proof image for your approval (please state if required). We use high quality outdoor vinyl applied to white 4mm correx (Fluted Polypropylene) which is 100% waterproof. Your boards will normally be with you within 5 Days. Style of board – For Sale or To Let, - etc. Boards to be printed both or single side. All our products are made of high quality professionally computer cut external waterproof vinyl.